The MX Series heaters by Lanair are our most advanced units to date. We combine the latest burner technology with the latest lean manufacturing efficiencies to produce a quality, reliable heater at the lowest price in the industry. The MX Series heaters by Lanair are our most advanced units to date. We combine the latest burner technology with the latest lean manufacturing efficiencies to produce a quality, reliable heater at the lowest price in the industry. Factor in unstable fuel prices and escalating disposal costs and you'll see that purchasing a Lanair MX Series Heater is indeed... "The Right Choice at the Right Time!" 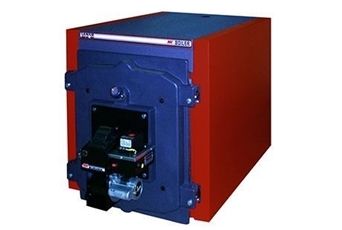 The MX-200 Waste Oil Heater is our second smallest unit pushing out up to 200,000 BTU's an hour. It features a fine grained galvanized (rust-resistant) cabinet to protect it in most shop environments, a high performance MX series burner that burns more efficient than any other burners to date, an internal fan to reduce excess noise in your shop, and adjustable locking louvers to direct air flow. All our units are UL listed so you can be assured that safety is a high priority with all Lanair products. Waste Oil (used crankcase oil up to 50 wt), #1 & #2 Fuel Oil, hydraulic fluid, automatic Transmission Fluid. Synthetic oil, up to 25% blend with above waste oil list. Cabinet Dimensions (H-W-D) 24" x 40.25" x 48"
****Customer supplied. Source must be capable of producing 2.0 CFM @ 60 PSI. † Stay away from gear lubes, they do not burn and will cause additional maintenance for your waste oil heater. Hazardous waste is illegal to burn in a waste oil heater. The EPA of the USA does not allow the burning of Brake fluid, and it is illegal to burn in a waste oil heater. There is no UL safety standard for the burning of Used Cooking Oil (vegetable oil) at this time. It should not be burned. Note: International customers should check their local regulations, as ‘what you can legally burn’ may change.